Welcome to our farming community nestled in the rolling hills of Richmond, Natal and our lives. My wife and I live in a quaint farm house situated at an unmanned airfield with a grass runway. We are avid aviation enthusiasts, so much so, that within crawling distance from our house is the hangar for our airplane, this is a life of Peace and Tranquility! During the week I lead a Training and Development Team for a large financial institution. My wife, assists in a charming little garden coffee shop, called “The Hangar” also at the airfield which is also only a few paces from our home. At weekends we are active members of the flying community, this is where our passion lies. And in a past life, I volunteered for the NSRI (National Sea Rescue Institute) as we lived near the beach and had fun in the sun while also caravanning as a family. So you may ask, how did our family and friends get hooked on this amazing cleaning product VuPlex®. Well, 12 years ago we became the proud owners of an airplane and so the upkeep began to keep her in pristine condition. We researched cleaning agents for aviation, that’s when we happened upon VuPlex® and so impressed by the product, we continued to use it. Other avid aviation enthusiasts noticed how well maintained our aircraft was and began asking questions about the cleaning agents we use. When we ran out of supplies from our initial purchase as we shared and encouraged others to use this amazing cleaning solution we now needed to purchase more. When we came to refill our stock, the South Africa (SA) distributor was no longer in business. We soon successfully sourced the Australian holding company who manufactures the product, and are proud to say we are now the sole South African (SA) Distributor. We have a far ranging reach through our online presence. 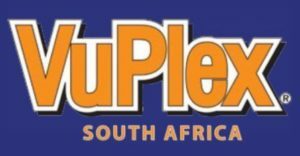 While having an online presence, VuPlex® is also stocked in several select retail outlets in Johannesburg, Pretoria and Durban. As you can see through our journey using this product there is an opportunity anywhere and everywhere to use VuPlex®or to recommend it to others. We hope you’ve enjoyed our story and we hope to meet you online or in our online store. Please visit these links to hear what our family and friends have to share about the product.